As the October air whipped cheeks at State Central Library premises, our flagship event REBEL COUNTY turned the biting cold into perspiration & the sweat-box that is the engine room heaves with heat & manic assaults of metal. Furthermore, to say that this will be the gig of the year for many in attendance, it would not be an overstatement. Black metal T-shirts lads and lass were seen crowding at the venue to witness a long, long awaited metal fest like this. Household name DEAD CALM CHOAS arrive on stage visibly as excited as any of the punters at the venue, they burst through a set so furious and has step a notch in terms of performance inducing uncompromising enthusiasm with their confidence and dexterity. Frontman Ryngkat Jyrwa is a man encapsulated by the highest energy level leading his pack ABERRANT. The quintet established an emotive purity that’s enviably effortless, and the tightness to their sound boasts both strength and technical stealth. Gently searing through the silence, a darkened ambience descends, wandering minds are engaged and all eyes become firmly fixed on the exposed stage- flooded in a wholly unholy white light; PLAGUE THROAT unleashed their lethal catharsis. Delivered with profuse power and passion, the caterwauling compositions soar and bombard the gut-wrenched spectators, displacing all atmospheres with a morbid wall of death. As Danish Death metallers and headliners DAWN OF DEMISE hit the stage, the serious business of turning the place into a sweatbox begins. Their performance was very satisfying and the songs sounded much like they do on the record. However, as they proceeded with their set, their songs were going out of fashion. The arrangements of the songs were predictable with more twists and diversified riffs the atmosphere could have simply been turned electric. Nonetheless, the fact remains that DAWN OF DEMISE held their own image in a live setting, playing quality tunes that made a lot of gig hungry people happy to mosh, happy riling and happily satisfied to go home with smiles and grins on their faces. Overall, REBEL COUNTY yet again made an impact and yes for all of you who were pissed at the delayed start we sincerely apologize and make sure it won’t happen again. We would like to thank our sponsors ICCR, Shillong and TNT The Northeast Today magazine. We would also like to extend our gratitude to Bah Manik and the Partners of Pla Iew Club for highlighting the event tag line with the most awesome crowd interaction and environmental awareness strategy. 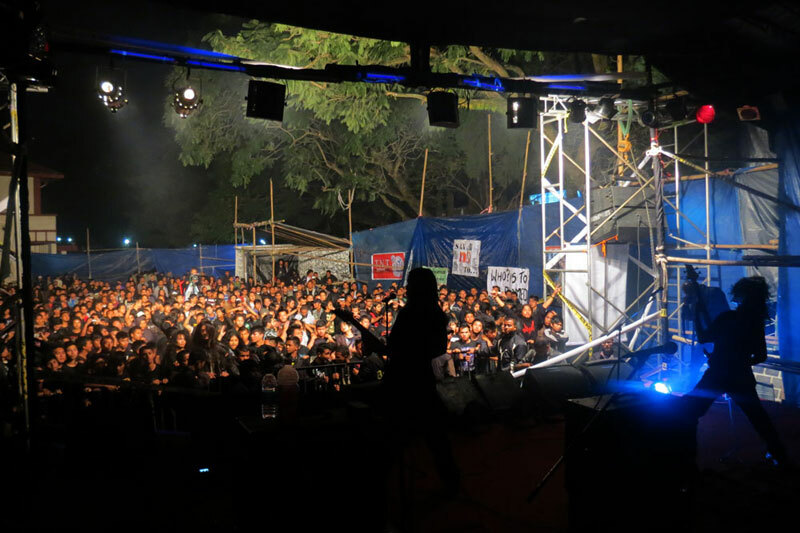 The team is back at the office and the place is now abuzz with a new list of musical extravaganzas, till then keep supporting us and we’ll make sure to comeback with gigs to die for. Cheers!